The Guitar Column: Electric Guitar Stilettos... Ayyyyy! 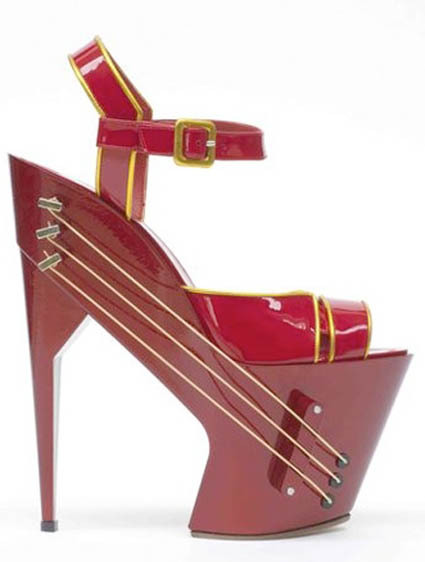 Designed by Max Kibardian in collaboration with Chicks On Speed for their Objekt Instruments collection, this stiletto incorporates strings, a pickup and a built-in wireless transmitter. I'm guessing the strings can be tuned and will vibrate with each step -- tune each shoe a flat 5th apart and you'll have a little Purple Haze intro happening! This one should have Manolo the Shoeblogger going ayyyyy! Birthday Tribute | Jeff Beck!